Anne O’Sullivan is the Manager, Customer Services and Branch Operations at London Public Library. Anne has 12 years public service experience in libraries, and has held most front-line roles over the course of her career. 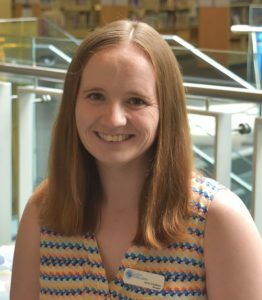 After graduating from library school, she spent six years in Alberta working for Calgary Public Library as a librarian and manager, before returning to Ontario in 2016 to take on a public service manager role at Milton Public Library. As a recent arrival to London Public Library, Anne is motivated to ensure that library services in her hometown continue to meet the changing and diverse needs of an urban population.